October 2, 2017 (HOUSTON, TX) – Houston-based commercial real estate firm, Boxer Property, is pleased to announced today its affiliate’s acquisition of 2000 Crawford Street. Formerly known as the St. Joseph Professional Building, the building will be renamed as part of future renovations. The 135,586 square foot, 18 story office building in Houston has a current occupancy of approximately 55%. Key advantages to this property include its convenient location near US Highway 59 and I-45, giving tenants incredibly clear views of The Galleria, Downtown, and Texas Medical Center. Located on the outskirts of Houston’s Central Business District, the building is situated on the Metro bus line with the MetroRail located nearby. Many fine and fast-casual dining options are available in the area with the Toyota Center located a mile away. Andre Pereira, Director of Acquisitions, represented Boxer Property during negotiations. Rudy Hubbard, Kevin McConn and Rick Goings of JLL represented the Seller. 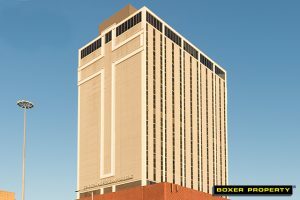 Renovations prior to Boxer’s acquisition include upgraded elevator cabs, lobby, restrooms, lighting, and boilers/chillers. Boxer Property intends to make additional improvements to the property’s interior and exterior in the near future. Boxer Property is celebrating its 25 year anniversary as an innovative commercial real estate investment and management company that specializes in maximizing the value of under-performing and challenged properties through aggressive leasing and hands-on management. Founded in 1992, Boxer Property Management Corporation is a privately held firm based in Houston that manages, leases, and administers retail, medical, hospitality and office properties with over 17 million square feet across more than 120 locations, nationwide. For more information, visit BoxerProperty.com.